Paperback: Chu Hartley Publishers, 2006. 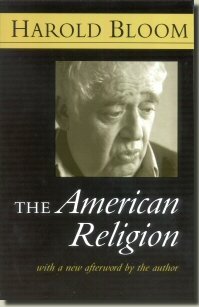 In this fascinating work of religious criticism, Harold Bloom examines a number of American-born faiths: Pentecostalism, Mormonism, Seventh-day Adventism, Christian Science, Jehovah's Witnesses, Southern Baptism and Fundamentalism, and African American spirituality. He traces the distinctive features of American religion while asking provocative questions about the role religion plays in American culture and in each American's concept of his or her relationship to God. Bloom finds that our spiritual beliefs provide an exact portrait of our national character. First published by Simon & Schuster in 1992, this paperback edition has a new afterword by the author.